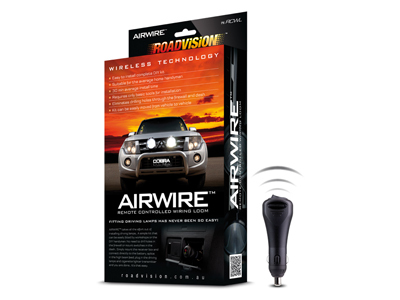 AIRWIRE™ takes all the effort out of installing driving lamps… A simple kit that can be easily fitted by workshops or the DIY handyman. No need to drill holes in the firewall or mount switches in the dash… Simply mount the receiver box and connect directly to the battery, splice in the high beam feed, plug in the driving lamps and cigarette lighter transmitter and you are done… It’s that easy. WIRELESS TECHNOLOGY – FITTING DRIVING LAMPS HAS NEVER BEEN SO EASY! Remove the main ground from the negative (B-) battery terminal. WARNING: This may result in a loss of radio security code and clock settings. Consult your owner’s manual before disconnecting. Install driving lamps to vehicle on a suitable mounting surface away from exhaust system or turbo. Find a suitable place within the engine bay and mount the receiver box ensuring that the cables are long enough to reach the battery, driving lamps and high beam wire. Identify the driving lamp connection leads from the receiver module; these are fitted with 2 pin Deutsch connectors. Plug the driving lamp leads into your Roadvision driving lamps using either the 2 pin waterproof Deutsch connectors or female push on terminals. Take care to ensure the black lead is connected to battery negative input (B-) and red lead is connected to battery positive input (B+) to your driving lamps. Identify the blue high beam feed wire from the receiver module. Using a multimeter or test light find the active high beam switching wire located at the back of the head lamp. Cut wire in a suitable position and feed both ends along with the blue high beam feed wires into the supplied 3M Gel filled connector. Crimp connector with a suitable pair of pliers. Identify the main battery connection leads from the receiver module; these are fitted with 8mm ring terminals. Connect the 8mm battery positive (Red B+) and battery negative (Black B-) leads to the vehicles main battery terminals using the 8mm ring terminals. Secure all excess wire to the vehicle. Plug in the cigarette lighter transmitter module into your cigarette lighter plug inside the vehicle. Test the driving lamps by turning on the ignition, transmitter switch to ON and head lamp switch to high beam. • Check switch operation – Green LED illuminated with lamps OFF and ignition ON, red & green LED’s illuminated with switch ON and ignition ON. 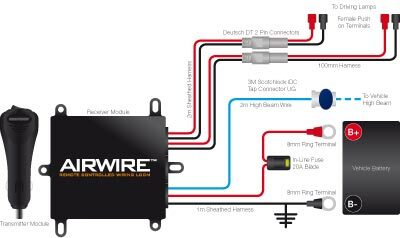 Note 1: This wiring harness is designed for use with 2 lamps only not exceeding 10 amps per light or a maximum output of 20 amps. Note 2: By law in Australia, driving lamps must be operated through both the vehicles high beam circuit and an additional ON/OFF switch. For applications outside Australia or where driving lamps are not being connected, simply connect the blue high beam feed wire to battery positive (B+).